Different kinds of foods in your diet are important to maintain oral health. That is because nutritional deficiencies can lead to poor oral health, including gum disease, bad breath, decaying teeth, and cavities. Unhealthy teeth can also affect the rest of the body. 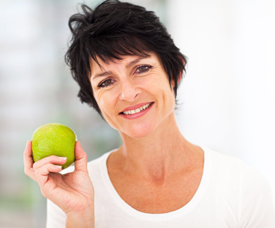 You want a healthy smile, not only so that you look good, but also so that you maintain your overall physical health. Regular visits to your downtown St. Petersburg dentist can help ensure your overall health and a healthy smile. How is Oral Health Impacted by Nutrition? There are basically two ways that oral health is impacted by nutrition. One is that teeth are made up of calcium. If you don’t eat enough calcium your oral health can suffer. Calcium and Vitamin D go hand in hand, so if you are getting enough of both you should be good. The other is eating fibrous foods that give your teeth a good work out. These foods are usually also low in acids that wear out the tooth enamel. A healthy smile is the sign of good oral health. Which are the Best Foods for Good Oral Health? These foods promote oral health and will go a long way in ensuring you have a healthy smile. • Cheese – rich in calcium and protein, cheese is delicious and your mouth produces more saliva when chewing it. • Yogurt – again a good source of protein and calcium. But it is also rich in probiotics, which help maintain digestive health as well. • Greens – leafy vegetables are healthy and contain calcium As they have to be chewed a great deal, they promote the flow of saliva as well. Kale and spinach are great examples. • Apples – this fruit is high in fiber and good for acidity. Chewing apples helps with gum health and keeps teeth clean. • Carrots – crunchy, sweet, and fibrous, carrots are a great source of antioxidants and Vitamin A. Eating carrots gives your mouth a workout and reduces the risk of cavities. • Celery – celery sticks with cheese are nutritionally a great idea because of the combined value of vitamins and proteins. • Almonds – a dense source of protein, calcium, and other nutrients, you can enjoy a handful of almonds with your meals or as a snack. Dr. Ferullo wants to build a lifetime partnership with you to maintain good oral health. He believes that St. Petersburg Gentle Dental care should be part of everyone’s oral health plan ensuring that patients comfort always comes first. Call Dr. Ferullo, your downtown dentist in St. Petersburg at 727-822-8101, to get started on having the healthy and beautiful smile you have always dreamed of.